Call it a man cave, a bachelor pad, or even your fortress of solitude. This is your apartment or a room typically decorated to a man’s tastes usually without female influence. Often these spaces serve to help the gentleman relax and unwind. Sometimes they can be for motivation and inspiration. I’ve put together a collection of fixtures to inspire and push the boundaries of what you might think is possible in a masculine kitchen or bathroom. 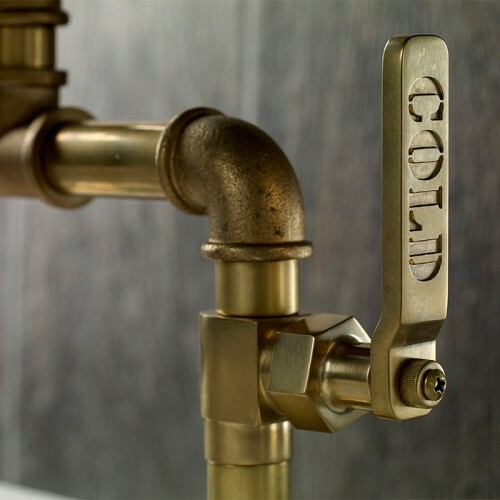 You may be familiar with Rocky Mountain Hardware and know that in addition to making beautiful bronze hardware they also make faucets. 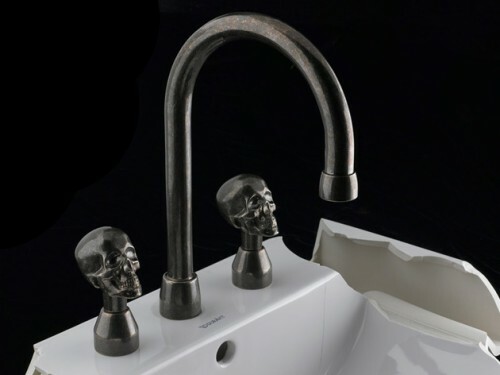 But, did you know they make this trendy faucet with skull handles for Faucetto? I seriously love the Elan Vital Collection from Watermark Designs. The collection takes the stripped-down industrial aesthetic to a new level. It features lever handles that are reminiscent of commercial ball vales, but uses modern-day ¼-turn ceramic disc cartridges and low-flow aerators. The Elan Vital is a Complete collection. It is available as bridge, wall mount, deck mount, floor mount and thermostatic shower. Fully customizable, every Elan Vital faucet is made to specifications given by design pros – there are almost no restrictions. New for the collection and possibly my favorite of the bunch is the deck mounted kitchen faucet with telescopic spout. The deck mounted lever controls volume and temperature using a hydro-progressive valve. The (optional) brass wire basket is perfect for keeping a sponge off the counter but close at hand. I think a masculine kitchen might need two – one for the sponge and another for the bar of Lava Soap. The independent side spray also uses a hydro-progressive valve. 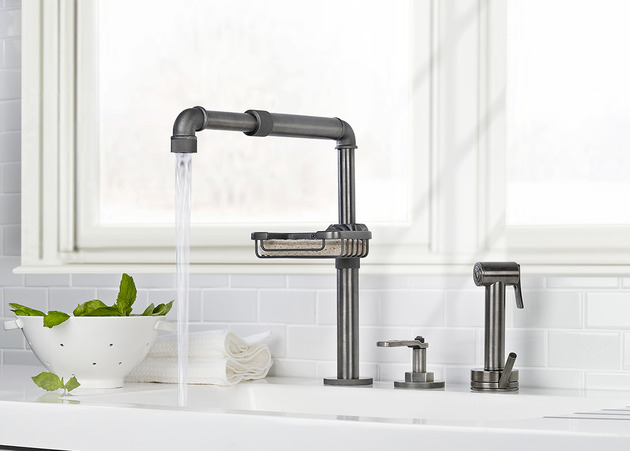 This faucet set is available in twelve finishes. 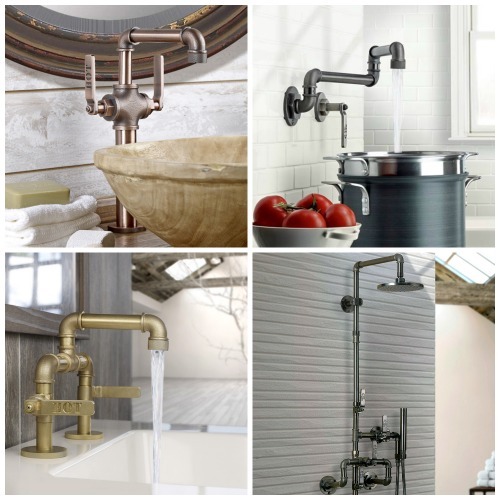 Whether you need a pot filler, a surface mounted shower unit or a single hole lavatory faucet, this collection blends the urban edge of utilitarian design with modern performance that’s sure to please. 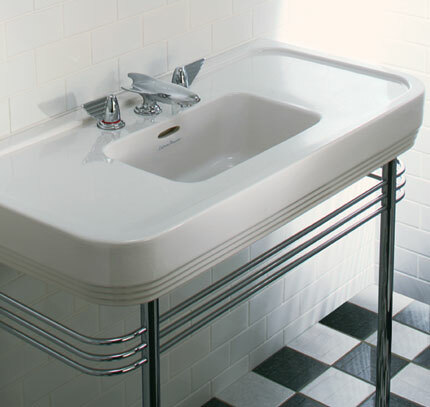 If you are more enchanted by the Streamline designs from the 1930s-1950s then the Belle Aire Collection from Lefroy Brooks is a perfect choice for a bachelor pad. Inherent in the Streamline’s design philosophy was the promise of a better world. The classic designs of the sink and faucet above are playful and distinctly glamorous references to the sense of luxury and optimism of the time. This tub filler is a great way to add a touch of historical fun to your bathroom. 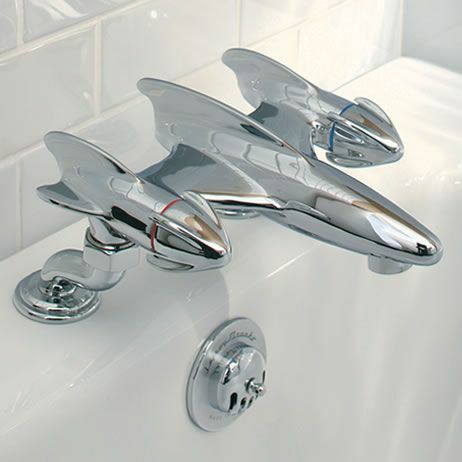 With a Chromium Plate, Antique Gold, Silver Nickel, or Satin Nickel finish, this shiny trio recalls the bulbous noses of zeppelins and the sharp fins of rockets. The 1951 Oldsmobile Rocket is credited with inspiring the Belle Aire Collection. Whether you are the Outlaw (Dennis Hopper), the Explorer (Richard Branson) or the Jock (David Beckham), if you embrace your specific style choice and let your man cave reveal your true persona you may find benefits that spill over into other areas of your life. Being inspired and having the courage to break the rules from time to time may actually result in you getting more attention and admiration from women than originally intended. I love all of these but the “Elan Vital” collection is a definite favourite!